Simply elegant: add a distinctive touch of glass to your kitchen decor / barware collection. 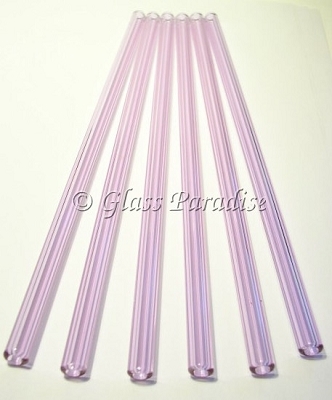 You'll receive this beautiful set of six translucent lavender glass drinking straws. Each one measures approx. 9" long x 9.5mm in diameter. Need a different length? Click here for custom straws. Made with hypoallergenic, non-porous borosilicate glass. The ends are flame polished (nice and smooth). As with all of our products, the glass straws are digitally kiln-annealed for added durability. These luxurious glass drinking straws are good for the environment and your health! Pyrex drinking straws are a unique "green" gift idea for any health enthusiast, or glass aficionado. We're always happy to combine shipping for multi-item purchases.